The N+2, designed by US global aerospace Lockheed Martin, is intended for commercial airlines, and aims to cut the travel time from New York to Los Angeles by half - from five hours to just 2.5. The aircraft would accommodate 80 passengers and have a tri-jet configuration in which one engine is on top of the aircraft and the other two are under each wing to reduce sonic boom. 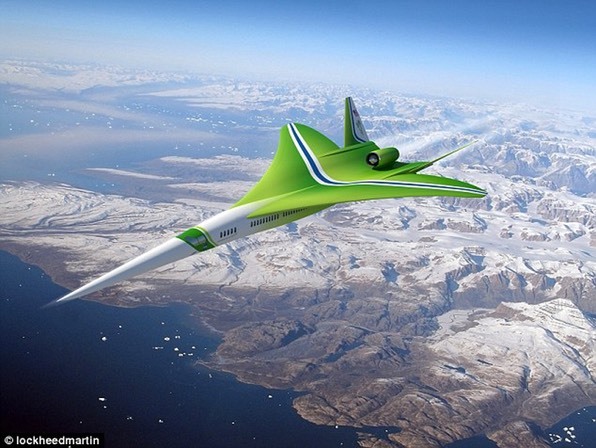 'To achieve revolutionary reductions in supersonic transportation airport noise, a totally new kind of propulsion system is being developed,' said Michael Buonanno, Lockheed Martin manager of the NASA N+2 program.